Become one of the World's Highest Paid Copywriters! Get Rich Working from Your Spare Bedroom, Sidewalk Cafes in Paris, Under a Palm Tree in Hawaii, or Anywhere Else. Copywriting is one of the most lucrative, fun, and intellectually stimulating endeavors you can ever do. It gives you a real creative high, and the chance to make ongoing income like most people don’t even dare to dream about. You can work for yourself, or accept contracts from others. You have the personal freedom to live and work from anywhere in the world (or at least anywhere you can get a decent Internet connection!). Whether you live in New York, Indianapolis, or Milwaukee, Rome, Trieste, or Milan–there will always be people who want more business. And they will joyfully give you a piece of the pie to produce it for them. You can have your office situated with a view of the mountains in Colorado, overlooking the sailboats on San Diego Bay, or just follow the sun, writing from beautiful locales around the world. You can work from anywhere! From any Starbucks or sidewalk café, a hammock in your backyard, or on a beach in Fiji. All you need is a mail drop for people to send your checks to, and somewhere to e-mail your projects from. As a trained copywriter, you can easily earn $75,000 or $100,000 a year, working part time from home in your bathrobe. If you’re serious and work more, you can rake in $250,000 a year, and those who are really good can even crack the million dollars a year threshold. You get hired to write a letter. You get an agreed upon price usually beginning at $500 for beginners and going up to $15,000 for experienced pros. That’s the base price. Then you get paid a small royalty from all the sales that come from that letter, or a set amount for each copy of the letter that gets mailed. For as long as it mails! If your letter becomes the “control” package, it can mail for years! It’s possible that one letter you write can make you $5,000, $8,000 or $15,000 a month in residual income. For as long as that letter mails! Think of what you can earn if you have four or five controls going at the same time. There are always more business owners, advertising agencies, and publishers who need good copy than there are good copywriters out there. You can’t swing a dead cat without hitting ten people who claim to be copywriters these days. But good ones who actually know what they are doing are quite rare. So those that do know make very handsome livings. Of course you may not want to hire your services out to others. You may want to use them for building your own business. And why not? You can use your new copywriting skills to drive traffic to your website, write a book proposal that gets a big contract, or get yourself booked on “Oprah.” Or maybe you need to write sales letters, ads, and website copy for your retail store, consulting practice or chiropractic office. You can develop your own products, or partner with other people with existing products. There are literally MILLIONS more joint venture and new product opportunities like this. Really. Or you can do it both ways! Work on your own products, and just take on the special projects that excite you and offer big-dollar potential for residual income. You can even use your copywriting skills to support a political cause, or raise money for religious or charitable organizations. Or you can select “all of the above.” The possibilities that open to you once you learn these skills are vast, numerous, and very lucrative. Craft a sales letter that–with the right product at the right time–can make you a million dollars, euros, or pounds! Of course we’re talking about Randy Gage. Randy has used his extraordinary copywriting skills to build two different multi-million-dollar businesses of his own. He also takes on special projects that attract him, and produced hundreds of millions of dollars in sales for those delirious clients. In fact, when Randy takes on a project, you can pretty much be assured it’s about to take off. Now we’ve gotten Randy to sit down and take his copywriting brilliance—and distill it into a step-by-step system, and put it into a authoritative manual, so you can learn how to become a world-class copywriter yourself. This manual is like no resource you have ever seen before. Randy lays bare his entire treasure chest of copywriting secrets, teaching you exactly how to do what he does. He reveals the psychological triggers that cause people to act. You’ll learn how to write throat-grabbing, gut-punching, persuasive, emotional, “killer” copy that will have prospects crawling naked over broken glass to get what you’re selling. In fact, by the time you’re done with this resource, you will be in the upper echelon of copywriters in the world because you are being taught by the very best. This is not the unproven theories of some copywriter “wannabe.” This is insightful, high-level teaching from the master—the man who does it better than anyone. And he will divulge exactly what you need to learn to become a great copywriter. Randy even gives you practice exercises to hone your skills before you take on your first client or project. By the time you go through this, you’ll be writing like a copywriting stud. Really. You can order Randy’s “How to Be a Copywriting Stud” for only $197. Or, if you would like to get a digital version of it, you can do so for only $177. This manual takes you through the entire process from crafting powerful headlines, pulling the reader into the copy, creating the offer, creating a powerful internal message, the call to action and a powerful P.S. At every stage you have practice exercises to apply the lesson and make sure you really understand it. 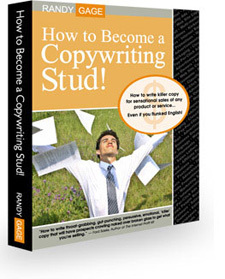 It is exactly what you need to write world-class copy and become a copywriting stud. Now I must warn you now, there are no refunds or returns on this product . . . This book will show you exactly how to write powerful compelling copy. But you have to be the one to do the work. So if you are the type of person who buys resources just have them look pretty on your book case, save your money. But if you are really ready to learn what it takes to become a world-class copywriter working from wherever you want, anywhere in the world, this is the resource to get. Order it now.